1980-04-08. Good. Ships with Tracking Number! INTERNATIONAL WORLDWIDE Shipping available. May not contain Access Codes or Supplements. May be ex-library. Shipping & Handling by region. Buy with confidence, excellent customer service! Tom Doherty Assoc.. PAPERBACK. 0523413343 New Condition. . New. Tom Doherty Assoc.. PAPERBACK. 0523413343 Like New Condition. . Fine. NEW YORK: TOM DOHERTY/PINNACLE BOOKS. VG IN WRAPS. MASS MARKET PAPERBACK.. 1697. MASS MARKET PAPERBACK.. REAR CORNER LIGHTLY BUMPED. PAGES CLEAN & TIGHT. . Condition: VG IN WRAPS. MASS MARKET PAPERBACK. USA: Pinnacle Books, 1967. FLASH GORDON "On the Lost Continent of Mongo"; (1967 ;; $1.50 original cover price);. PBO (Paperback Original) True First Ed.. Soft Cover. As New. Illus. by AL WILLIAMSON. 12mo - over 6¾" - 7¾" Tall.. Mass Market Paperback.. Edition: PBO (Paperback Original) True First Ed. Pinn. Used - Good. Good condition. USA: Pinnacle Books, 1967. 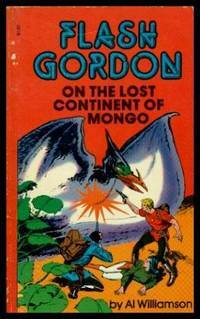 FLASH GORDON "On the Lost Continent of Mongo"; (1967 ;; $1.50 original cover price);. PBO (Paperback Original) True First Ed.. Soft Cover. FINE++, Almost New!. Illus. by AL WILLIAMSON. 12mo - over 6¾" - 7¾" Tall.. Mass Market Paperback..
Tom Doherty Associates. Used - Acceptable. Binding is slightly damaged and/or book has some loose pages. No missing pages. Pinnacle, 1967. 1st Edition. Paperback. Fine. Paperback. New York: Pinnacle Books, 1967. Unpaginated. Light edgwear with minor creasing on the covers and an uncreased spine; no interior markings. Fully illustrated in comic book format. Flash Gordon started life as the hero of a comic strip in 1934. Since then, he branched out a bit... . First Paperback Printing. Paperback. Very Good. Illus. by Al Williamson;. New York, NY, U.S.A.: Tor Books, 1967. Unknown Printing. Mass Market Paperback. Fair. Brief summary of content available upon request by e-mail. New York, NY, U.S.A.: Tom Doherty Associates, 1967. First Paperback Printing. Mass Market Paperback. Very Good. Brief summary of content available upon request by e-mail. Tom Doherty Associates, 1967. Unknown Printing. Mass Market Paperback. Good. Brief summary of content available upon request by e-mail. New York: Pinnacle, 1967. Book. NF. Paperback. PBO First Edition. PBO. A NF copy. Pinnacle #41-3343 with a 1.50 cover price. First printing. Scarce..
E Rutherford, New Jersey, U.S.A.: Tom Doherty (Tor), 1967. A near fine paperback.. Paperback. Near Fine. Tom Doherty A very good to fine paperback. Copyright 1967..
Tom Doherty A very good to fine paperback. Copyright 1967. Tom Doherty Associates, 1967. Reprint Edition. Mass Market Paperback. Very Good. N. Y.: Tom Doherty Associates, 1967. An uncreased spine with light edge rubbings. Store stamp. 1st Edition. Comic-Paperback. Very Good +. Illus. by Williamson, Al.